Hospice Seminar - Movie Night & Discussion - November 30th, 2013 ~ The Toronto Hare Krishna Temple! Who among us will not be in need of compassionate, spiritually-centred care at the end of our lives? 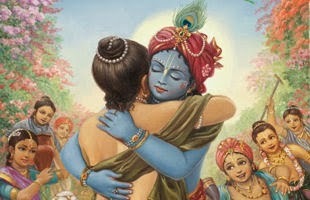 In 2010, a Hospice Seminar was facilitated by Sangita devi dasi (Susan Pattinson), a Srila Prabhupada disciple, at the Bhaktivendanta Academy in Alachua, Florida. Sangita mataji is a registered nurse who specializes in hospice and palliative care and has more than 16 years of hands-on experience with the spiritual wisdom written in ancient India's Bhagavad-gita As It Is. She is the author of "The Final Journey - Complete Hospice Care for Departing Vaishnavas". This well-received workshop that has been presented worldwide teaches the fundamental principles of how to care for terminally ill friends and loved ones should you be confronted with such a challenging circumstance. The ideas presented and discussed will assist you to better understand the physical, emotional, social, and spiritual processes that often occur when someone is faced with his or her final months. On Saturday, November 30th at 6:30pm, we invite you to attend a Movie Night where we will view segments from the videotaped seminar that Sangita mataji conducted in Alachua, Florida. While we won't watch the entire 3-hour seminar, we will go through very important segments of it and perhaps engage and a small discussion. We will also have handouts to follow the seminar. This will be a very informative seminar and a great opportunity to become aware of how to care for devotees during their greatest time of difficulty. 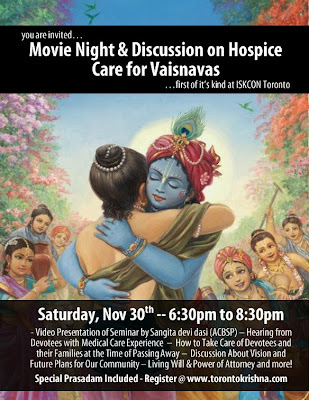 Once again, the movie night will take place on Saturday, November 30th at 6:30 at the Hare Krishna temple! Special Prasadam will be served at the end and a very interactive discussion during prasadam!